Rent Mother Nature’s peach growers told us that this year’s crop is looking great -Georgia’s sunny weather helps the ripening process along in fine style! As we repeat in so many reports, there is a good reason for tree-ripened produce to be prized. The longer a peach remains on the tree the more acid turns to sugar, making it a sweet peach! A peach will ripen faster on a tree in one hour than it will in 60 days in cold storage. Now that is interesting! “de-fuzzer” to be shaved of excessive peach fuzz, and only then is it packed and delivered to your door within two days. 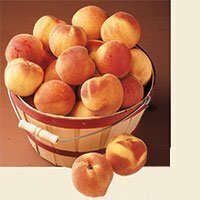 Peach trees need a great deal of watering to develop good-sized, juicy fruit, and the growers can usually count on Mother Nature to supply the needed rain. The trees in the grove look healthy, and the peaches are in excellent shape. Since the vigilant growers keep the ground around the tree free of fallen fruit that can attract pests, the orchard looks like a well-tended garden. Please visit our web site: www.RentMotherNature.com where you will find gift suggestions for the hard-to-please and even something for that someone “who has everything for any occasion.” You will be glad that you did.